Thanks to its AH-IPS technology, the 34UC97 looks pretty good from a 45-degree side angle. There is a visible light falloff, but color integrity is maintained perfectly. You'll also see a slight green shift and loss of detail when viewing the screen from above. If you’re wondering how the curve affects off-axis quality, in our opinion, it doesn’t. It’s much more subtle in person than in photos. With a zero-percent field pattern displayed, you can see slight hotspots in all four corners of the 34UC97, hurting the overall test result. LG's sample isn't the worst one here, though. We might theorize this is a weak point of the WQHD form factor (we’d have to measure more samples to say for sure). But obviously, AOC solved the issue somehow. Even though LG finishes in last place, 7.77 percent is a good result. You won’t see any problems with the naked eye in brighter content. According to our C6 meter, the issue here is a slight hotspot in the center. None of the monitors in the group have a visible color uniformity issue. This is area where IPS panels usually out-pace their TN counterparts. Then again, we’ve seen many newer TN monitors do well in this test. The EA294WMi is almost freakishly good, though the 34UC97 isn’t far behind. 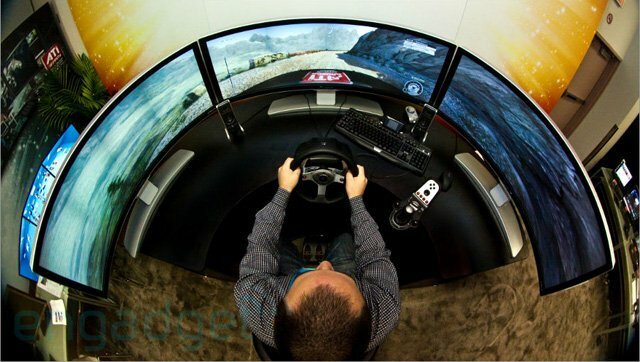 The thought of gaming on three 34UC97s is almost drool-inducing. But we had to settle for a single screen. Luckily, its response time is fairly quick among 60Hz monitors. Most IPS panels hover around 25 milliseconds, and a few can draw the white field in 21. It’s not a huge difference, but when the action gets frantic, a little less motion blur is a good thing. The 34UC97 cruises to a comfortable first-place finish in the input lag test. While you won’t mistake it for a 144Hz model, most gamers should frag on it just fine. The immersiveness of the super-wide curved screen easily makes up for what it lacks in ultimate speed.